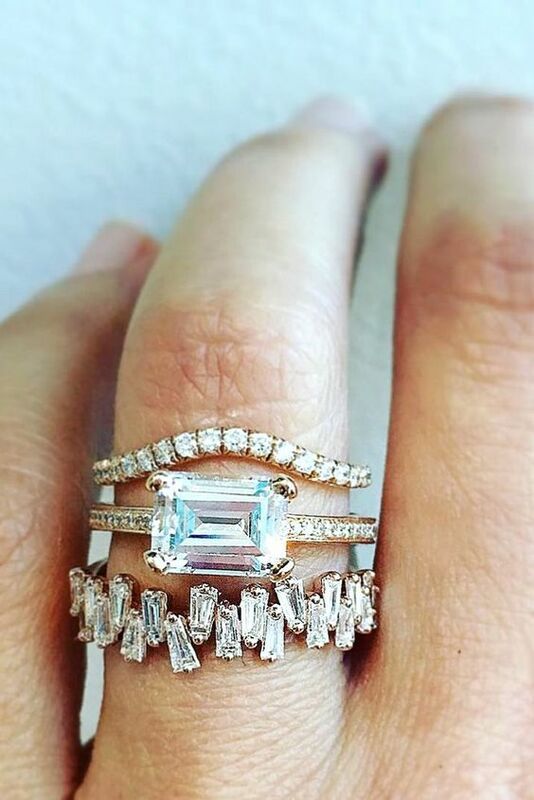 Choosing a wedding ring that you will wear everyday for the rest of your life once you say ‘I do’ is a big deal! Not only is it a ring that you have to love it also holds far greater meaning than that you are simply married. Wedding bands are often an afterthought with far more time being spent choosing an engagement ring. However your wedding band is a symbolic reminder, of the union of commitment and love that you have pledged to your now husband or wife. A symbol that will be with you for a lifetime. Therefore you should take the time to consider which is the ultimate ring for you and why. With such an important purchase where should you start? We’ve put together some of the top things to consider when choosing this all important jewellery purchase. 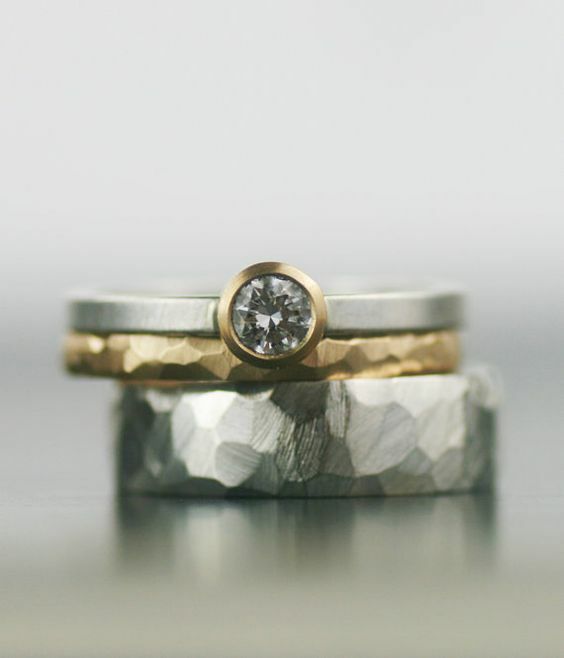 There are so many wedding rings out there to choose from and with the option to also have one made to your very own unique design it’s easy to feel like a rabbit in headlights. Don’t overcomplicate it narrow down the basics of what you are looking for to get you started. 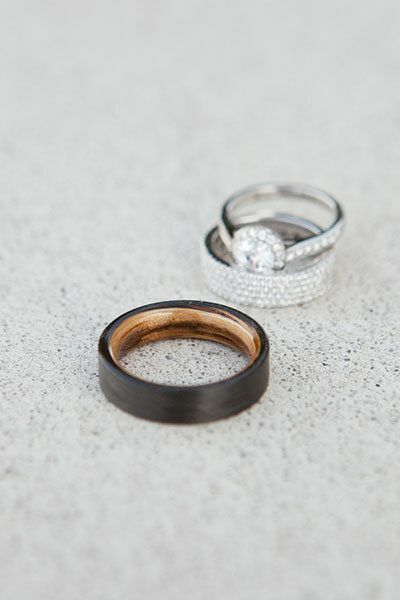 Traditionally the metal chosen for your wedding band is dictated by the metal of your engagement ring. Nowadays this doesn’t have to be the case. 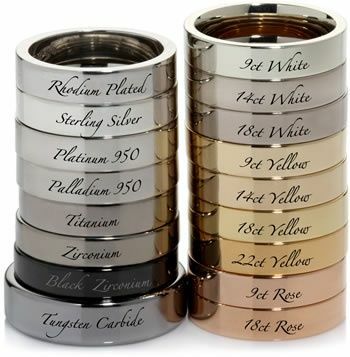 White gold and platinum are the strongest metals, however rose gold has seen a huge surge in popularity in recent years. 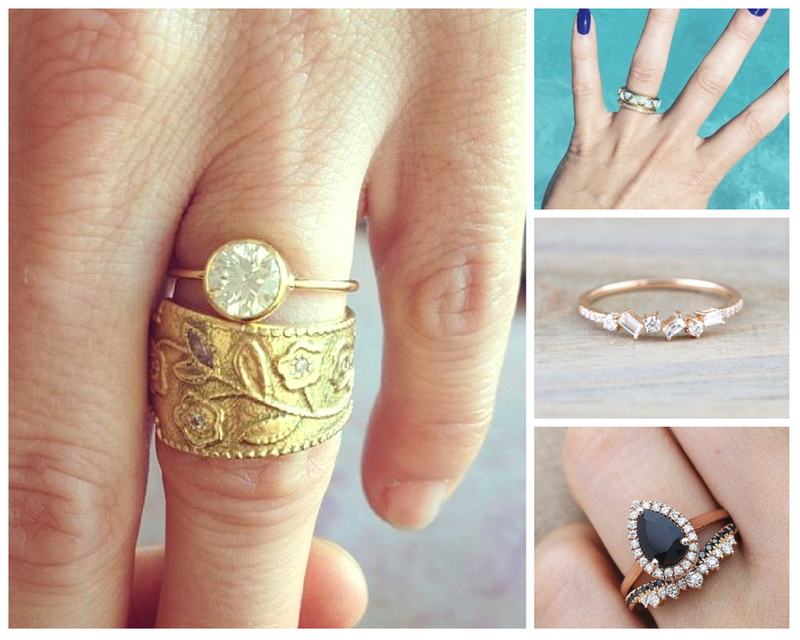 Mixing and stacking different metals to suit your own individual taste is also big right now. Prices will vary depending on the style and weight of the metal you choose so consider this when putting together your budget. 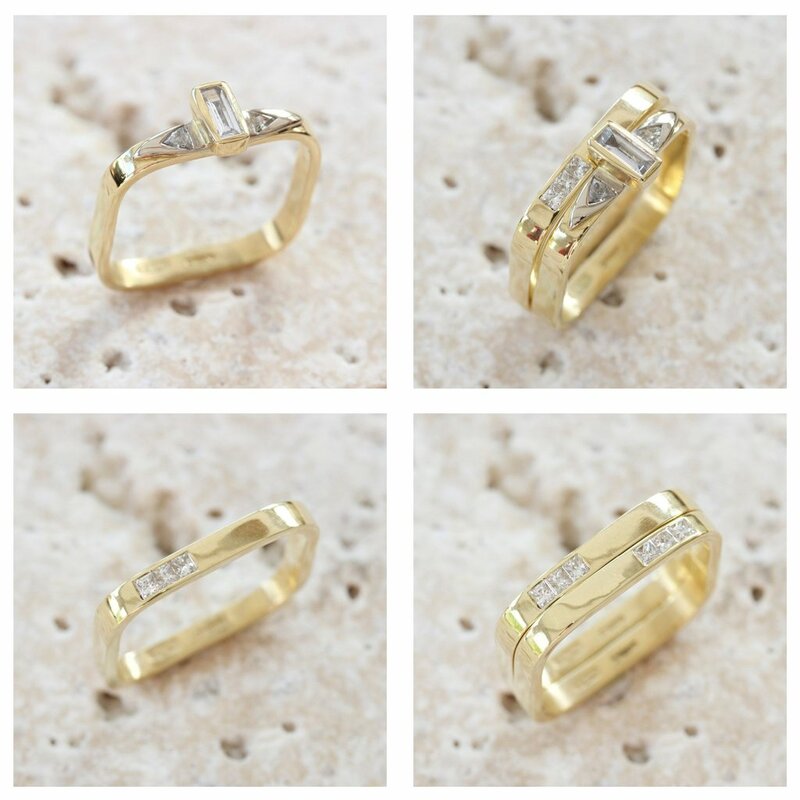 Yellow gold is considered more traditional and comes in a range of different strengths. This is something you should consider depending on the day to day wear and tear your ring will encounter. 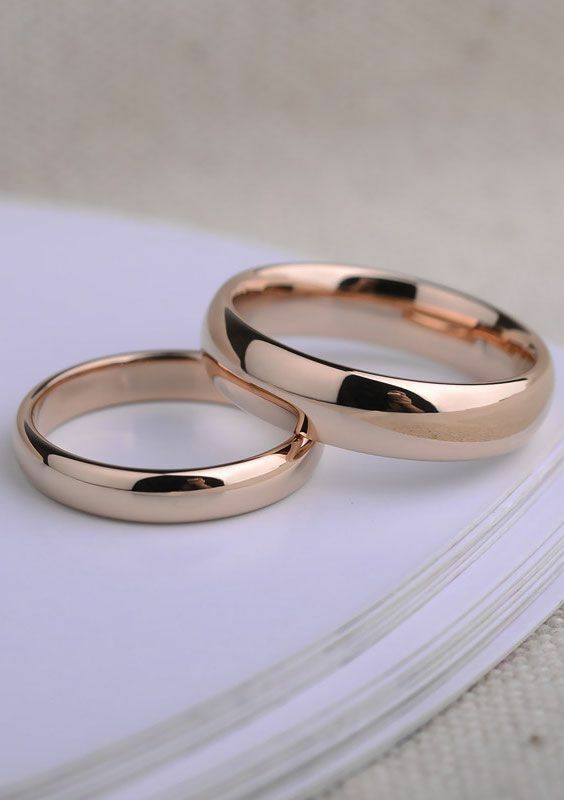 Generally, 22ct gold is too soft to wear every day, so consider buying 18ct, 14ct or 9ct gold wedding ring to reduce the chance of damage and wear. Lower levels of gold are combined with stronger metals and are better suited to the demands of day-to-day life. If a platinum wedding ring is an expensive ask when matching with your engagement ring white gold is a good alternative and compliments platinum perfectly. Although white gold is often rhodium plated and will wear off over time this is easily re-applied to keep your ring looking as good as new. Platinum is currently the most popular material with modern couples. It is extremely tough and perfect for everyday wear. More expensive than other materials but will last forever without showing a mark. If platinum is too expensive for your budget palladium could be the ultimate alternative. It looks and wears just like platinum but without the expensive price tag. Titanium is up and coming when it comes to creating jewellery. Strikingly different in colour it is a popular choice with men. The plus side to this metal is that it is extremely lightweight, budget friendly and scratch-resistant. Zirconium, black zirconium and tungsten carbide hold similar properties to titanium and appear very similar. One of the decisions that may also be dictated by your engagement ring is the shape of your wedding band and how it will fit alongside. If the aim is not to overpower your engagement ring it is advised to choose a band width similar to that of your engagement ring. We often worry about the two rings looking like they are part of a pair but this doesn’t have to be the case. Each of the two rings both have very different meanings and therefore it doesn’t hurt for there to be a clear distinction between the two. The final consideration when choosing the shape of your wedding ring should your engagement ring have a large centre stone that this could cause a large gap between the two rings. Here’s when a shaped (also known as curved or fitted) ring may be better suited. 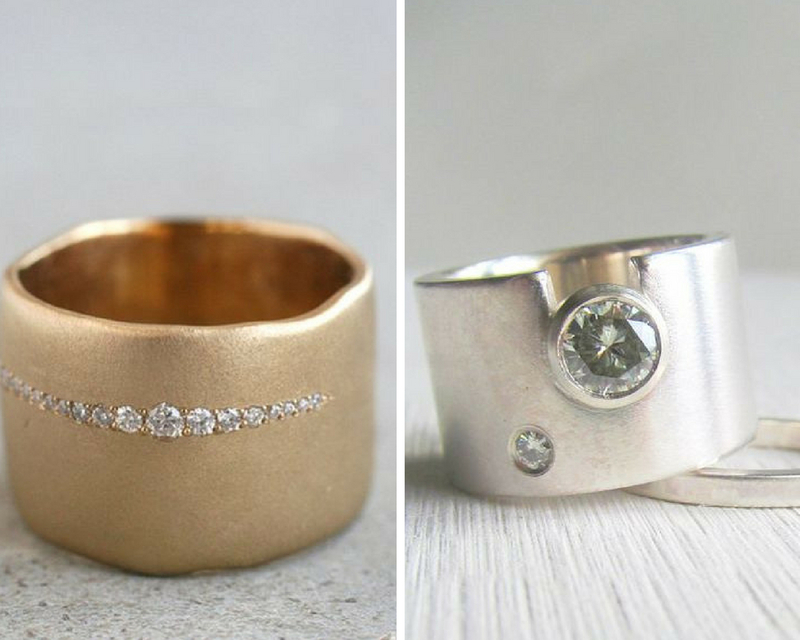 Even if you don’t need your wedding ring to be shaped it may be something to try. See how it might look alongside your engagement ring. 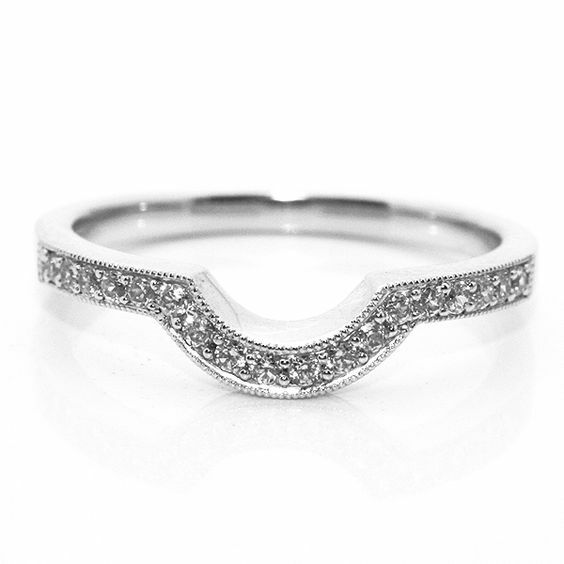 Should you wish to think as far ahead as an eternity ring it may also be worth thinking about how this will eventually fit too. Often choosing the final piece is down to taste and what you envisaged this special ring would look like. Although there are all the above points to consider it is also important that your own style comes into play. There’s no good having something just because it looks perfect as ‘it should’. 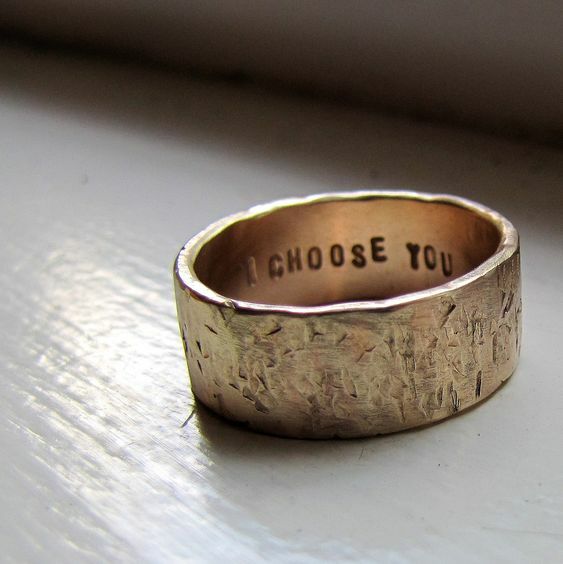 You need to love this ring for a long time and therefore you need to put your stamp on it. So if plain bands and predictable diamond eternity rings are not your style and you crave something a little different why not create your own. If you have a design in mind, it may be well worth speaking to a jewellery designer who can make your idea a reality. For those who like a traditional wedding band but would like a point of difference coloured stones are really in right now and will give a little personality to a plain band. Increasing in popularity these rings create a feature of your engagement ring wrapping around it to complete the set. It also gives scope to add a little style of your own as opposed to a simple straight band. 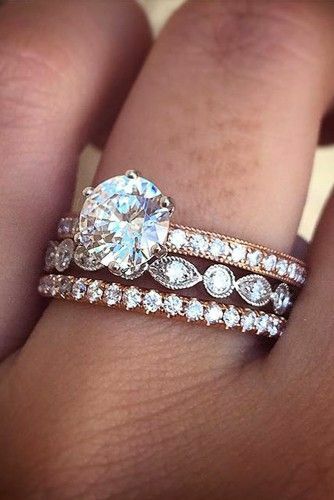 If point two is that’s bothering you most it may be worth considering replacing your engagement ring with your wedding ring and moving your engagement ring to the other hand in order to get the best of both worlds, especially if the ring is quite large and chunkier based on the style you’ve fallen in love with. 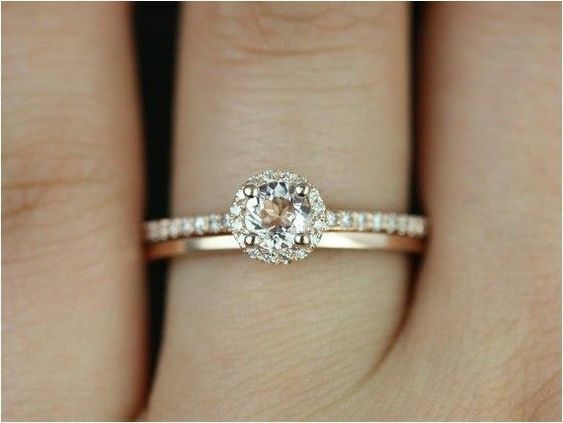 However if you still envisage two rings together then there will be some compromise when it comes to your wedding band. Tradition was always that the bride and groom chose matching wedding rings, however these days it’s simply down to taste. Some brides and grooms still choose to match rings while others simply choose something that suits their individual style, matching or not. 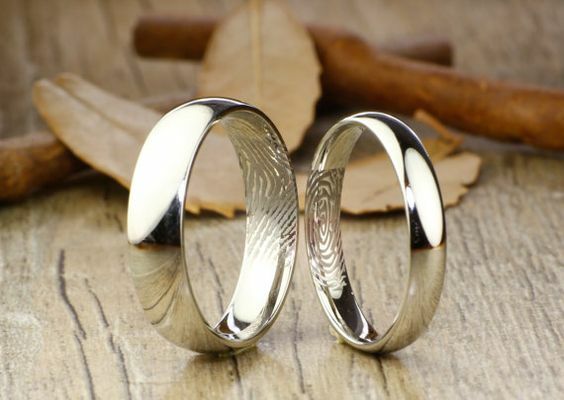 If you like the thought of matching rings but have different ideas on style maybe an option could be to have rings made which incorporate these ideas so there is something in their that holds synergy. You may choose to add to the symbolism of this special piece but it’s not essential. It is however a lovely opportunity and will give you the chance to have a romantic inscription added, the date of your wedding and initials or maybe even a pet name you hold dear to each other. When it comes to setting a budget for your wedding bands you must take into account the chosen material along with the width of the band as this will determine the initial cost. From there if diamonds are to be added or something more individual is to be made all these things will impact the cost. Re-plating of white gold will incur an on cost ever 12-18 months so take this into account too. As for what the price of a wedding ring should be there is no right or wrong it is simply down to personal choice. Remember although your wedding ring has to be the right one for you it is not necessarily worth picking up a huge debt for the sake of a few compromises. We think that choosing your wedding rings as a couple is a must. Dedicate real time to wedding ring shopping maybe even a couple of weekends. Visit more than one jeweller to view different style and ideas before making a final decision. Tradition is that you buy each others wedding rings so make sure that you’re each happy with what you’re buying. If it’s easier for your to view your options in the comfort of your own home there are some jewellers that are happy to brings a selection of wedding rings to your home. This is a great option if high street shopping isn’t really your thing and will allow the jeweller to give you their undivided attention without interruptions. We hope you are now armed with enough information that choosing your wedding rings will be a far easier process and you now have in mind exactly what you’re looking for. For more inspiration take a look at our Pinterest boards or our sister company TLK Jewellery where we can design and make your ideas a reality. I find it interesting that couples can opt to have a ring made from zirconium, titanium, or white gold aside from silver and platinum. Reading this article convinced me to share this with my cousin, who is about to propose to his girlfriend next week. To help him, we will go through different jewelry stores so that he can make an informed decision on which ring he can use to propose to her. My brother is starting to look for a ring for his girlfriend. It is good to know that you can get rings that interlock. That is a fun new style of a wedding ring. It might be smart for him to see if his girlfriend likes that style of ring.